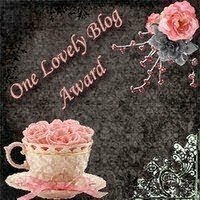 Thank you to A Little Bit of All of It for selecting this blog as a “One Lovely Blog Award” winner. I will strive to live up to the loveliness! Now I am honored to pass along the prize to 15 blogs I read. I picked only mamas I have met in real life. That isn’t part of the rules but it helped me narrow down my selection! For those who choose to pass along the award to others, the rules are: accept the award on your blog and then select 15 lovely blogs to award. Hopefully a few of you ladies wll pass along the award to others. Posted in Beauty and tagged one lovely blog award. Bookmark the permalink. Thanks Julie, You’re so sweet! Surfing this list has been a great way to spend the morning! You know some tremendous people; maybe I’ll get more acquainted with their blogs over the winter when I have l…o…t…s of time on my hands. I may be the oldest winner but certainly not the wisest. Blessings to you and yours! hope to post on this and pass the award along soon! !